We’re doing something a little different this week. 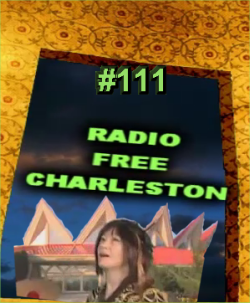 We are debuting a new episode of Radio Free Charleston on a Friday. You can see it right below this block of text. The show this week features music from Andy Park, Stephen Beckner and Stone Soup, plus some offbeat animation and a public service announcement for Covenant House that stars Ann Magnuson. Most of this episode was shot at The Empty Glass on Thursday, September 16, during a benefit for Empty Glass Records, a project that will allow Charleston’s most celebrated bar to install recording equipment so that they can preserve the magic moments that happen there on a regular basis. Watch the show, then follow the jump to read all about it, and also check in with a music-packed weekend here in town. RFC 111, “Teefury.com Shirt” from Rudy Panucci on Vimeo. Like I said, most of this show was shot at The Empty Glass. Not only is the World Famous Glass installing recording equipment, they also have a brand-spanking-new sign, thanks in part to the East End Main Street organization. Host segments were recorded outside the Glass, on Elizabeth Street, where the UFOs aren’t as bad as they used to be, and in those segmens I am wearing a shirt from Teefury.com. Teefury offers up shirts with cool designs that are only available for one day, then they disappear. I’ve worn several shirts from them on the show already, and have more on hand to wear in the future. The shirt I’m wearing on this show is nameless because I got it on one of their “grab bag” days, where they clear out leftover shirts from the previous month. Which is why I don’t know what the shirt is really called. Check ’em out if you like funky, original T shirts. Before we delve into the music, we have a new public service announcement for Covenant House, starring Ann Magnuson. This is an entertaining spot for a very important cause, so visit the Covenant House website to find out how you can help. Our first musical guest is Andy Park. Andy has an acclaimed new CD out, and you may know Andy as a member of The VooDoo Katz. We’ve wanted Andy on the show for some time, and we will have him on again in the near future. You can catch Andy live at Taylor Books on October 1 and at Lola’s Pizza on November 3. Andy performs “Theme Park” from his new CD, “True Love.” This is a great song about a relationship that is also a crash course in dealing with mental illness. Reminds me of my brief disastrous marriage. The mysterious off-screen backing vocals are courtesy of Camille Armstong, who is a big fan of Andy’s who was singing along from the audience. One other trivia note: Andy is one of the few guests we’ve had on Radio Free Charleston who has actually seen and spoken with RFC Big Shot, the reclusive Frank Panucci. 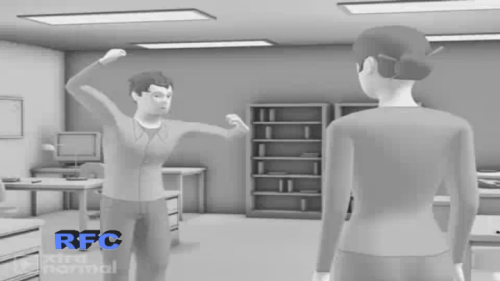 Our Animation this time comes from the industrial wizard, P-Dox. Eagle-eared viewers may be able to identify a guest stint by Hasil Adkins on the soundtrack. Stephen Beckner is our second musical guest. 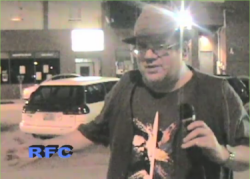 Stephen may be the person who has guested on RFC more than anybody else. He appeared on our second show, back in 2006, and has been on RFC as a solo act, a member of Go Van Gogh, a member of Hitchcock Circus, a member of The Nanker Phelge, a filmmaker and an animator. Stephen was also a regular guest on the RFC radio show, back in the Paleolithic era. We are thrilled to have him back on this time, his first appearance with his new “Buddy Costello” look. 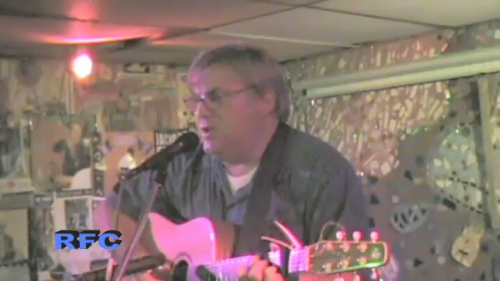 Stephen performs the song “Fragile.” We’re going to have Stephen back on the show soon with The Nanker Phelge. Wrapping up the show, we have Stone Soup, from Spencer. I just did get to meet this group of musicians, and did not get the chance to tell them how impressed I was before I had to leave the Glass last Thursday to write last week’s PopCulteer. I don’t know much about this group, but I do know than any group who can get people up and dancing to “The Hall Of The Mountain King” needs to be on Radio Free Charleston. That’s the story of RFC 111. We look forward to seeing what Empty Glass Records unleashes on the world. First Off, the theatrical event of the weekend is HOODS, the striking drama by CYAC about racial tension in West Virginia, circa 1957, Read my preview of this play here. Several past guests of Radio Free Charleston are playing in and around town this weekend. The big event is The LiveMix Farewell Party, kicking off at 8 PM at LiveMix Studio on the fifth floor of 1033 Quarrier Street. LiveMix, and all the creative people in the Quarrier Building are being evicted by Monsignor Sadie, who needed the building to store his Hummel collection. Mother Nang, Electro Biscuit and Cousin Larry are expected to perform, and other msuicans will likely drop in to pay their respects. We’ll keep you posted on the future of our RFC production partners. InFormation, who just appeared on RFC 108, will bring their alternative power pop to Taylor Books Friday at 7:30 PM. There is no cover charge and loads of great beverage choices. 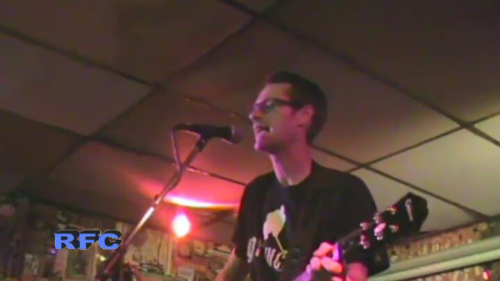 Later Friday, Jeff Ellis and Todd Burge and The Odd Urges will start playing at 10 PM at The Boulevard Tavern. The cover charge is five bucks. Jeff was on our gala 100th episode, while Todd appeared on last year’s Christmas show. Among the Odd Urges, you’ll find John Radcliff and Joseph Hale of OVADA. 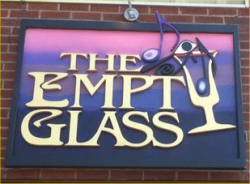 600 Lbs Of Sin, featuring RFC 83 guest Sierra Ferrall, will be at The Empty Glass Friday, starting at 10 PM. Cover is five dollars. 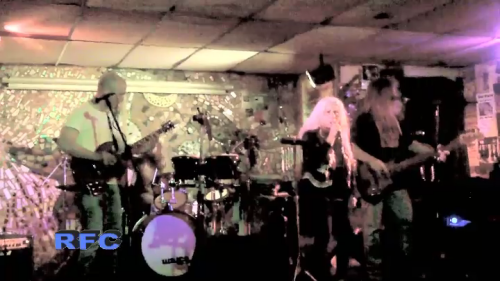 Friday and Saturday, White Chapel District, seen on RFC 72, will bring their metal assault to Tomahawks, on MacCorkle Avenue between Spring Hill and Saint Albans, starting at 9 PM. There is no cover charge. Saturday at 7:30 Pm, frequent RFC guests, The Buttonflies, will be performing cover-free at Taylor Books. RFC 40 guest, Paul Calicoat, with Jay Oakes, will be at The Alban Theater in Saint Albans starting at 7:30. Admission is ten dollars, five for students.